Many pregnant women who lead hectic lifestyles are not always in the mood to spend hours preparing a well-balanced meal- but this doesn’t mean they can’t eat healthily. Having a strategically-stocked pantry will ensure that great nutrition is as easy as opening a can of beans (and a few other easy-to-prepare ingredients). Stocking a pantry with the following foods will provide important nutrients needed in higher amounts during pregnancy, each of which can be whipped up into a delicious meal in a matter of minutes. Read on to discover which pantry-perfect foods you should keep in stock during your pregnancy. Fruits and vegetables: Pregnant women should consume 2 ½ to 3 cups of vegetables and 1 ½ to 2 cups of fruits in their daily diets and, if smartly-stocked, a pantry is the perfect place to go to help meet this recommendation. 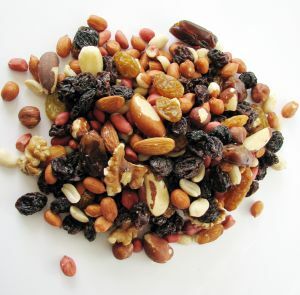 Dried cranberries, apricots, and figs are a perfect snack, plus they contain important nutrients such as vitamins A and C in dried cranberries and apricots and potassium and manganese in figs which are all important pregnancy nutrients. Canned: Another pantry superstar is canned pumpkin which is versatile and full of flavor and great nutrition. Not only is it low in calories and fat and high in vitamins A, C, and E, but it can be used as a base for soups and stews and incorporated into baked goods. Plain pancakes can be turned into pumpkin pancakes by adding a quarter cup of canned pumpkin to whole wheat pancake mix. It can even be added to brownie mix by swapping the eggs and oil for a can of pumpkin which creates a more fudge-like, healthier brownie. Another especially nutrient-dense pantry superstar is stewed tomatoes or low sodium tomato sauce which is an excellent source of vitamin C and contains a host of disease-fighting phytonutrients. It’s the perfect topping for whole wheat pasta. Vegetarian Protein: Pregnant women need about 71 grams of protein per day. You can get the recommended amount of protein by consuming about 5 ½ ounces of protein a day during the first trimester and 6 ½ during the second trimester. Many great sources can be found in your pantry. The following foods can be considered as a 1-ounce serving: 1 ounce of canned fish, ¼ cup cooked beans, 1 tablespoon of peanut butter, or ½ ounce of nuts or seeds. Beans are a good source of protein, fiber, and zinc; they are a delicious addition to soups and stews, burritos, salads and rice dishes. Mashed garbanzo beans make a tasty hummus dip. Canned light tuna (which is lower in mercury than albacore tuna) and canned salmon are great protein sources which can be added to a salad or made into a savory sandwich. Try to buy fish canned in water instead of oil to reduce fat and sodium intake. Keeping natural peanut butter (avoid varieties with the words “partially hydrogenated” in the ingredients list as they contain harmful trans fats) is perfect for spreading on whole grain bread to obtain a satisfying serving of protein. Whole grains: Pregnant women should try to eat 6-8 oz of grains per day. Half of the grains eaten in a day should be whole grains. 1 ounce equals a slice of whole grain bread, ½ cup cooked rice, ½ cup cooked whole grain pasta, 3 cups popped popcorn or five whole wheat crackers. A general rule of thumb is each grain product should have three grams of fiber. The pantry is the perfect place to stock up on whole grains. Cereals, crackers, pretzels, and brown rice are all great whole grain options which provide more fiber and b-vitamins than the refined versions which help boost energy. Whole-grain noodles can be tossed with their fellow pantry superfoods, olive oil, and stewed tomatoes, to create a nutrient-rich combo. 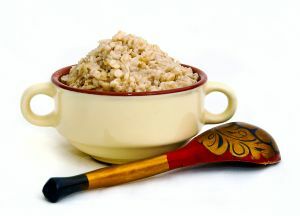 Oatmeal is another pantry essential providing a quickly prepared, low-cost, satisfying serving of the important minerals manganese and selenium as well as a hefty dose of soluble fiber to reduce cholesterol.